The river Styx, Charon the ferryman and a shade. Scene from Wrath of the Gods. Lethe (LEE-thee). A river in Hades whose waters caused forgetfulness. It was on the banks of another Underworld river called the Styx that the shades, or ghostly remains, of the dead congregated to seek passage to the Afterlife. 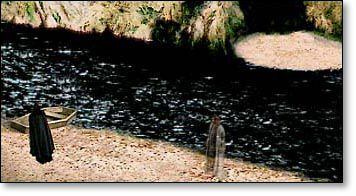 Unless they bribed Charon to ferry them across the stream, they wandered aimlessly on the near bank forever. But those who made it across the Styx did not have much more to anticipate. Once they had drunk from the waters of Lethe, they were left with nothing to reminisce about for eternity.